Update on December 8, 2015, by Mike Epstein: Gaylord Hotels, part of Marriott International, announced that they’ve finished integrating a new in-house hospitality system from Enseo across their properties. The Enseo system combines standard hotel TV offerings with over-the-top (OTT) smart TV-style apps, including Netflix, Hulu, YouTube, Pandora, and Crackle, in every room. The system also allows guests to play audio through their room’s TV by connecting their smartphones or other devices via Bluetooth. Guests will need to have their own subscriptions to stream from the apps. The news follows recent announcement from sister brand, Marriott Hotels, which started offering Netflix streaming at select properties. Gaylord, which manages five properties that specialize in hosting corporate events, including the Gaylord National in Washington D.C., the Gaylord Opryland in Nashville, the Gaylord Palms Resort in Kissimmee, Florida, and the Gaylord Texan in the greater Dallas/Fort Worth area, is using a different implementation (each brand in Marriott’s portfolio operates separately), from Enseo, which puts an Apple TV-like interface on in-room televisions and goes beyond just Netflix. Enseo’s platform uses the properties’ existing coaxial wiring, which allows the the system to handle other IT functions like hotel information, guest check-out, etc. Enseo says Gaylord is the first hospitality brand to utilize the platform across all of its properties. According to the hospitality integrator, Gaylord guests guests are watching OTT streaming apps for more than 1,400 hours a day. Original article: Travelers don’t have to worry about being parted from Netflix while on the road anymore — at least not if they’re staying at select Marriott Hotels. 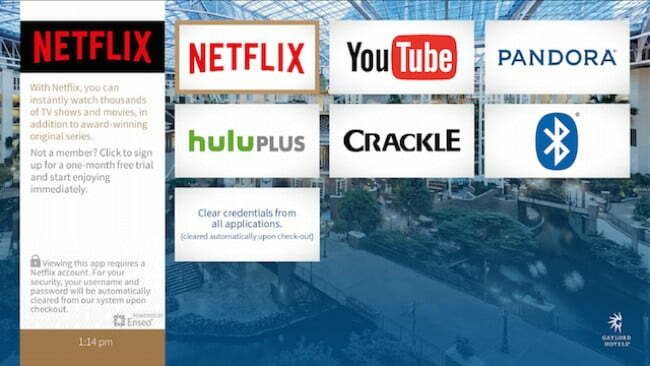 The company announced today that is has become the first hotel brand authorized to offer Netflix to guests. Through a partnership with the streaming service, Marriott has now rolled out a special version of the Netflix app on in-room TVs, designed specifically for the hotel environment. Guests at six properties so far can take advantage of the app, which allows them to subscribe or login to an existing account to view content on their hotel room’s TV. The Marriott version of the app will keep them signed in throughout their stay, and then automatically log them out when they check out. With travelers already streaming while they travel on mobile devices and PCs, offering them direct access from the big screen seemed like the next step. “Our collaboration with Netflix responds to changing consumer preferences in the way our guests access and watch content, while recognizing the leading role Netflix is playing in driving this transformation,” said Matthew Carroll, vice president brand management of Marriott Hotels in a press release. The number of Marriott Hotels properties offering Netflix is slated to double this summer, and then reach 100 stops by the end of the year. Nearly all of the 300+ U.S. Marriott properties will roll out the app by the end of 2016. The partnership seems like a good move for both companies (Netflix’s stock has already gotten a boost), and it’s a win for travelers as well. Being able to watch Netflix on an actual TV screen rather than a mobile device always makes for a better viewing experience. We just hope travelers don’t get sucked into TV binges and miss their chance to explore the local sites.